Giorgos P. Tsironis, Professor of Physics at the Physics Department of the University of Crete and head of the Nonlinear and Statistical Physics Group at the IESL-FORTH, is an internationally renowned researcher in nonlinear dynamics, well-known e.g. for his pioneering work on discrete breathers, intrinsically localized modes, and more recently on quantum metamaterials. He obtained his PhD in Theoretical Condensed Matter and Statistical Physics from the University of Rochester (USA) in 1987. He was a postdoctoral associate at the University of California San Diego (1987-89) and the Fermi National Accelerator Laboratory (1989-91). He became assistant professor of Physics at the University of North Texas (1991-96) and was also affiliated with the Superconducting Super Collider Laboratory (1991-1993). He joined the Department of Physics of the University of Crete in 1994 as associate professor and became full professor in 2000. Over the years Giorgos has held a number of other academic positions: he was visiting professor of the University of Barcelona in Spain (2000-1 and 2006-7) and professor at Nazarbayev University in Kazakhstan (2014-15). More recently he has been a visiting fellow at the School of Engineering and Applied Sciences of Harvard University (2017 and 2018). His research interests are in the areas of condensed matter physics, statistical mechanics, nonlinear physics, complexity, biological physics and metamaterials. In 1996 he received the international Stephanos Pnevmatikos award for his “many contributions to nonequilibrium statistical mechanics and the theory of solitons in non-linear lattices, with applications to molecular crystals and biophysics”. Giorgos’ current activities focus on the role of nonlinearities and breathers in superconducting metamataterials and machine learning applications in complex systems. He has published over 160 papers in refereed journals and has organized and co-organized numerous international conferences, workshops and advanced summer schools in the area of statistical mechanics and non-linear physics. Throughout[t1] his career, he has mentored 14 PhD students, many of whom currently hold faculty positions in academia. 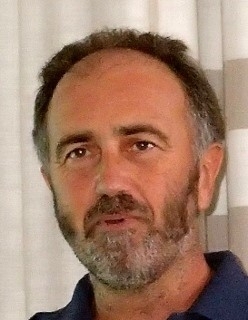 Among his many academic leadership positions, Giorgos has served as director of the University of Crete Computer Center (2003-09), chairman of the Department of Physics of the University of Crete (2007-2011), acting chair of the Department of Physics, Nazarbayev University (2014-15) and deputy rector of the University of Crete (2016-17). In recent years, he established the Crete Center for Quantum Complexity and Nanotechnology and succeeded in attracting considerable EU funding through a REGPOT grant for its initial stage 2013-2017.